As I mentioned in an earlier post I visited Vienna this summer and the folks at Vello Bike. The Vello Folding Bike caught my eye two years ago with Vello’s first Kickstarter program. 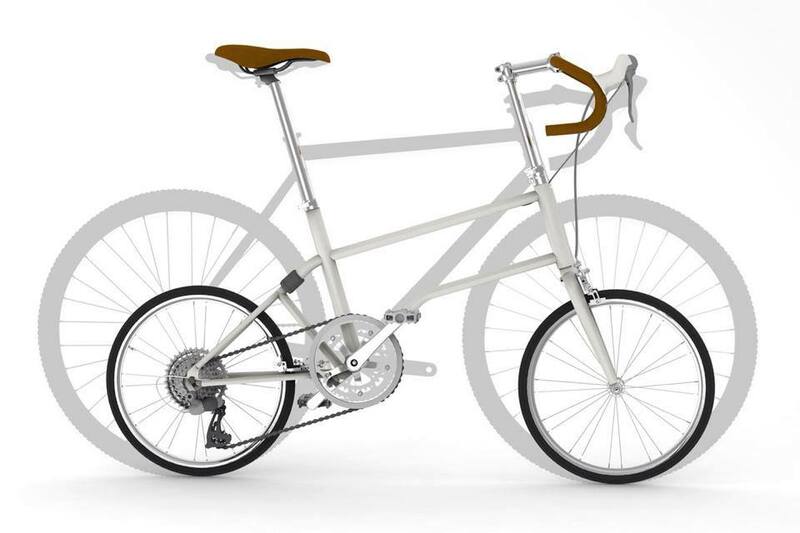 This Kickstarter was to launch their first version of the Vello folding bike. Version one Vello featured the rear wheel folding under the frame. This was the version that I was able to test for a few days while visiting Sopron Hungary. There are three models of Vello, the Urbano, a bike designed for comfort and commuting, the Rocky, a Vello designed to rock the city and the Speedster, designed to race the city. The Vello I tested was the Urbano, which features a comfortable saddle and M-style handlebars. The Vello M-style handlebars are not as curved as the Strida. While visiting the Vello Studio in Vienna I did get to ride the latest version which includes the front fork fold and the electric assist. More about the Vello + with electric later. I will admit I have very little experience riding different folding bikes. 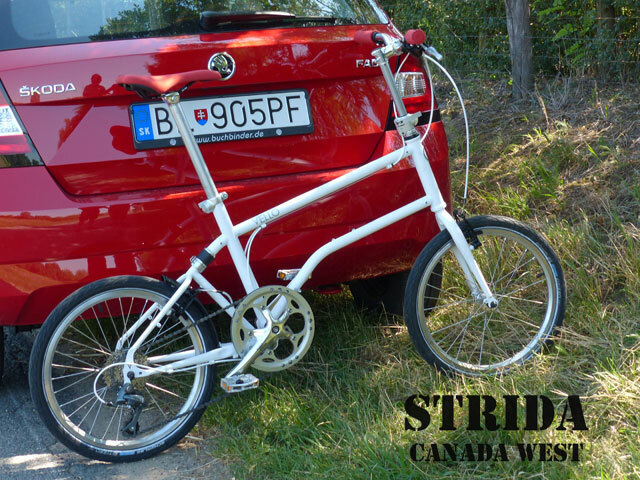 My experience is riding the Strida and reading and talking to other owners of folding bikes. 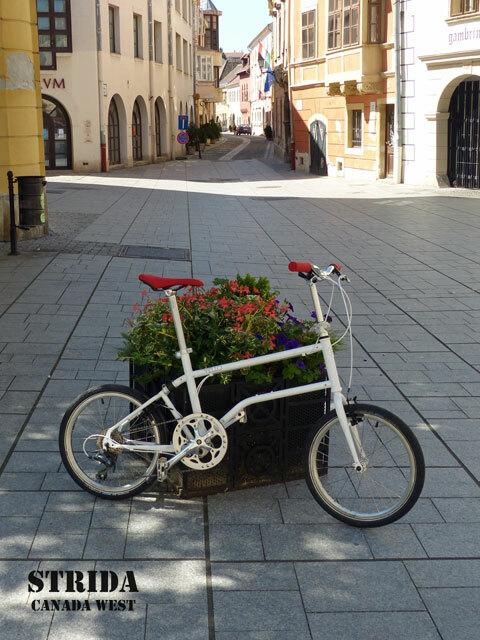 The Vello folding bike is a very stable riding bicycle and doesn’t ride like a small wheel, short wheelbase bike. This may be because the wheels are 20 inch or 406 and the wheelbase is close to the same size as a full size bike. Another reason is the geometry of the Vello. Speaking with the designer Valentin, he spoke of the attention to detail of the geometry, the stiff frame and the stable ride being a priority of his. For myself it was very noticeable, I was comfortable with the first pedal stroke. The light weight but stiff chrome molly steel frame reminded me of my first road bike. With us Strida owners we are spoiled, the upright riding position of the Strida is very comfortable and was designed to be that way. The Vello for me is not as comfortable but I am OK leaning forward on a bicycle. The forward lean on the Urbano is not that much because of the height adjustable stem riser. I automatically adjusted the stem riser to it’s full height as seen in my photos. There is also an optional adjustable stem available that I was not able to test. The adjustable stem will provide another 20 cm of adjustment. As I said earlier the Vello Urbano with the stem riser at it’s full height and the M-style handlebars I was comfortable and I could ride this way for several hours. This was not so for my wife, she rides a Day 6 and a Cruzbike recumbent bicycle and is most comfortable with a forward pedal, upright body or recumbent position. I am looking forward to receiving my own Vello this Fall and seeing if the optional adjustable stem will help her feel more comfortable. But as you can see the Vello is very different than her other two rides. The suspension shock on the Vello is held together with a magnet and the weight of the rider. To fold the frame, one holds the rear tire to the ground with your toe and pulls up on the top tube. The magnet separates and the rear wheel folds under the frame. There is a pin that automatically locks the frame in place and at this point the Vello can be rolled on the rear wheel. To compact the Vello fully, the locking pin is pulled and the rear wheel folds further under the frame. This operation is very smooth and easy. Next open the quick release levers on the seat post and the stem riser. This makes it possible for the seat post and the stem riser to compact into the frame. The handle bars can be turned to match the frame or there are optional folding handlebars. With the current model of Vello the front wheel is removed to minimize the size. 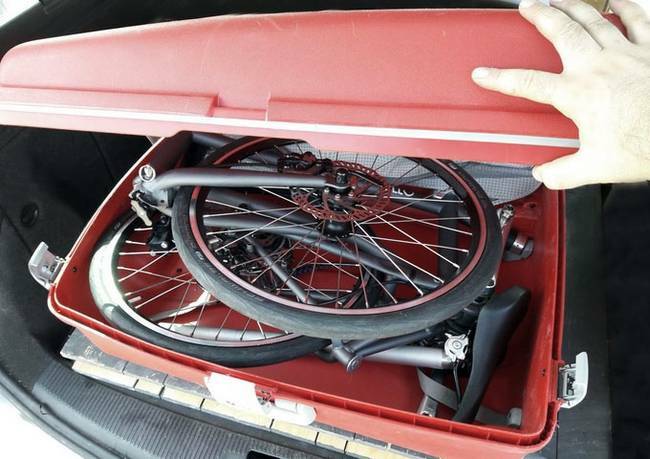 I was able to place two Vello bikes in the back of our rental compact car easily. I did get to see and ride a version three Vello folding bike prototype which included the front folding fork. In my opinion the folding front fork is what will make the Vello a very special bike. The folding fork has passed all testing and is now in production. With the folding fork the Vello with 20 inch wheels will fold quickly and fit in a legal for flying size suitcase. Vello have a custom designed hard and soft case available for this purpose. The Vello and rented car. I haven’t mentioned the Vello brakes. The model I tested had V-Brakes, Tektro RX6 with a quick release. With the quick release it was easy to remove the front wheel. My first impression of the brakes was, these are not Strida disk brakes! As most of you will know the disk brakes on a Strida are very good. It is easy to take them for granted, the V-brakes on the Vello are good, just not as good as the Strida disk brakes. There will be several options available for the Vello, including disk brakes. Also good for Strida fans to know there is also a optional belt drive. The rear wheel dropouts have been designed to be able to tension a belt. The Vello + is the electric assist Vello. This Vello model is being promoted as the worlds first self charging electric assist folding bicycle. Now this is quite a claim which received numerous comments when introduced on TreeHugger Magazine last year. I would encourage you to read the TreeHugger review, because I think it is well written and informative. In that review the Vello designer Valentin has supplied answers to some of the critics who question the validity of the self charging claim. What I can add is my experience of riding the Vello +. 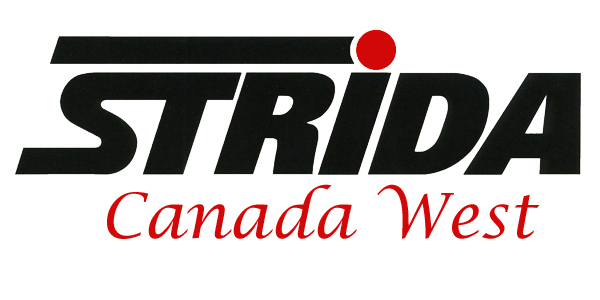 If I have little experience riding other than Strida folding bikes then I have no experience riding E-bikes! What I have seen of E-bikes and what I expect of the ride is a conventional bike but heavier, much heavier and the corresponding handling. My experience riding the Vello + was just the opposite, the Vello is nimble and fast, very fast. At 12 kg the Vello is the same or less weight than a Strida EVO. The Vello + has a sensor that measures the slope and displays it on the required smart phone. It uses this information to activate the recharging system. Valentin also explained to me how I can manually activate the recharging by backpedaling twice. This is a feature that I liked and would use. I gear down when driving and slowing down a vehicle. Doing this on the Vello + felt very natural and helped recharge the battery. The recharging system on the Vello + is active even when going at a slow speed, this is partly what makes this system very efficient. I have never before seriously considered an electric assist bike for my self, five minutes riding the Vello + and that all changed. I started having visions of attaching a trailer to a Vello + and crossing mountain passes and entire countries with easy pedaling all the way. So I am looking forward to receiving a folding front fork version three Vello folding bike this Fall. This may be the Vello + which includes the electric assist. I do plan on stocking the Vello folding bike for sale in the Spring 2018. If you are interested in the Vello please contact me. Here is a link to Vello’s Fall 2016 Kickstarter program. Delivery was slated for April 2017 but that date has now become Fall 2017.